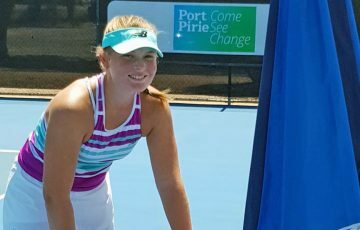 Talia Gibson on Thursday was crowned Australia’s 14/u girls’ champion after beating Charlotte Kempenaers-Pocz in an absorbing final at the December Showdown. 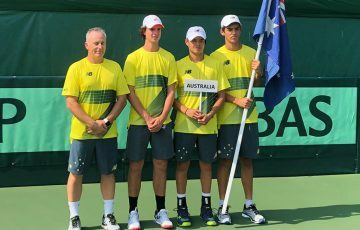 Later on Thursday, Derek Pham made it a brilliant double for Western Australia when he claimed the boys’ title with a three-set win over Japan’s Shogo Sanada. 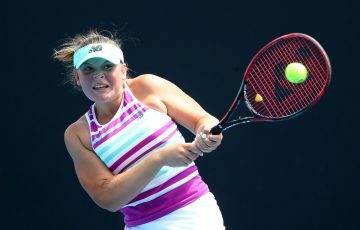 Gibson recovered from the loss of a tense second set to run out a 6-2 6-7(2) 6-4 winner in just over two hours at Melbourne Park. The victory marks her first national title, which was her goal coming into this year’s Showdown. “It feels so amazing. 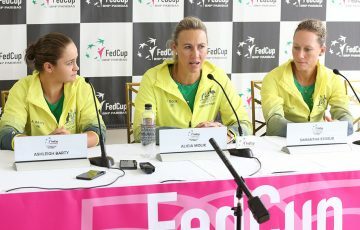 I’ve been working as hard as I can to get here and just winning it has been the best feeling ever,” she told tennis.com.au. 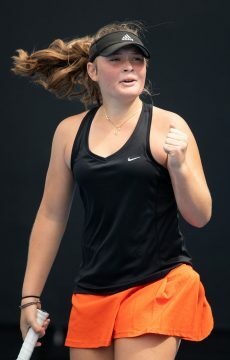 Gibson, the No.3 seed, had not dropped a set en route to the final and appeared in control again on Thursday when she lead Kempenaers-Pocz by a set and a break. The top seed dug in, but Gibson produced a flurry of winners to break for a 6-5 lead. She served for the match, but errors came, and Kempenaers-Pocz dominated the ensuing tiebreak to extend the match to a third set. 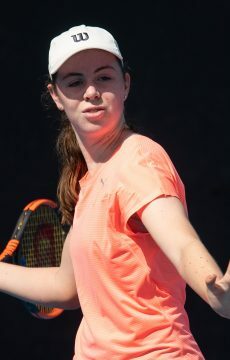 Gibson re-focused, and after games went on serve for the majority of the set, she broke in the final game with another raft of winners to seal victory. She admitted she was “super nervous” on the inside, but found a way to keep hitting out. “I’ve always been quite an aggressive player – I like playing really hard (laughter). Ever since I was really young I liked to hit the ball hard,” she said. “I was happy with how I was composing myself on court. When the times were a bit tough I was proud of myself because I like stayed calm and came back really well. 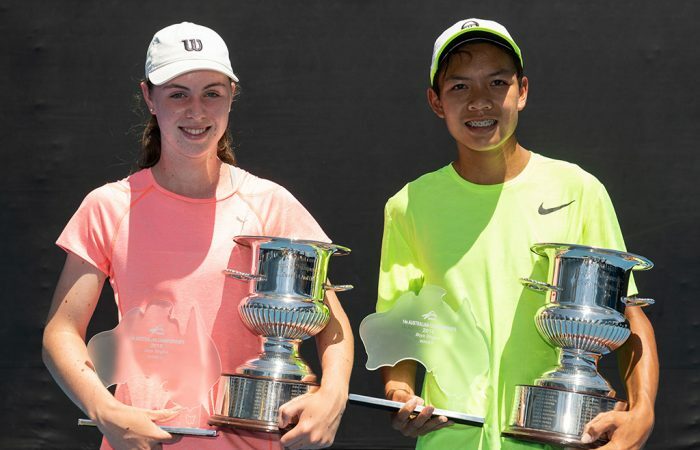 Next week Gibson will contest the 16/u Australian Championships as the December Showdown continues. “The aim is just to give it my best and go as far as I can,” she said. Following the girls’ final onto court were Pham and Sanada, who played out their own absorbing contest before Pham emerged victorious. Growing in strength and confidence as the match progressed, Pham completed a 6-7(4) 6-3 6-2 triumph. “First set was alright; and then I just found my mojo and got the victory,” laughed Pham, who held a set point in the opening set. “Throughout the whole match I had rhythm but in the second set I just thought I’m gonna step it up and bring my game style, which is being an aggressive baseliner. So not let him dictate play, and that just worked. 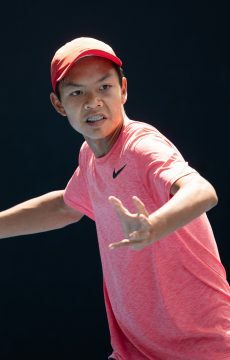 Pham built a 5-0 lead in the final set before Sanada – last year’s 12/u champion at Melbourne Park – closed the gap to 5-2. Yet Pham produced a pair of searing groundstroke winners in the next game to reach 0-40 and earn a bundle of championship points, of which he converted the first. He revealed he had scouted Sanada by chatting to fellow players who had faced the Japanese player in the early rounds, and felt he held an advantage over his opponent in terms of being better prepared for the summery conditions. “I’ve definitely come into this tournament being a lot more professional than I normally am,” he said. “Not even on the court – just before my matches, pre-match routines, minor things to help me concentrate. In my matches my serve was helping me out a lot, getting me a couple of free points here and there, where it mattered, so that was helpful.